Diana (Mary Steenburgen) is a ray of sunshine in Paddy's dreary life in "Last Vegas." Photos courtesy of CBS films. IT’S nearly darn impossible to pass on a film that features a passel of A-list stars or fine acting talent, though they are usually a disappointment. You simply can’t miss it, just in case you really miss something. Though in the end, you could have passed. But it is better to have been disappointed having had the experience than not having had the experience, thus never knowing or having actually missed something. In other words, a conundrum. 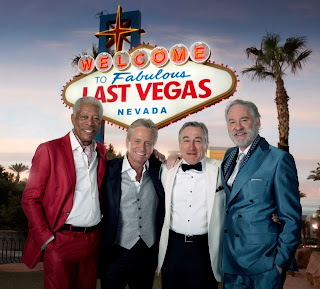 Such is the case with “Last Vegas.” The film, which opens in the United States today, stars Robert De Niro, Michael Douglas, Morgan Freeman and Kevin Kline as four nearly 70-year-old childhood friends who reunite for a bachelor party for the last of their circle. He plans to tie the knot with a woman less than half his age. Maladies of aging notwithstanding, such as strokes, overprotective children, loneliness, Florida retirement as well as too many prescription drugs, among other gripes and slights, they still get themselves to Vegas. “Last Vegas” features practically every Las Vegas cliché in the book. Here are four old cats spending too much time drooling over young kittens. Here are images that some will love and other will loathe. (See video below). The film is not terribly bad, but it is far from good. There are a few – very few – mildly laughable lines. Dan Fogelman’s script is puerile, pedestrian and fails to engage. It should also be noted that there are a couple of instances where old women are fodder for laughs. Not funny. This bit of misogyny is partly ameliorated by the delightful presence of Mary Steenburgen as Diana, an empty-nester and tax attorney who came to Vegas to realize her lifelong dream of being a singer. In a film of top-billed testosterone, she holds her own with aplomb. To the extent that bodies remain in seats has much to do with the prodigious talent of the four gentlemen on the screen – all Academy Award winners – though “Last Vegas” requires little acting muscle. A film about the making of "Last Vegas" would probably be more interesting. How in the world did director Jon Turteltaub or whomever get these titans onboard?! Essentially, here are four thespians nearing the twilight of their careers who have practically done it all – and what the hell? – they are just along for a little fun with colleagues of their own stature. It is interesting to observe the four different performers. De Niro, not at all a comedic actor, as Paddy assumes the Brooklynese curmudgeon role he does in the “Meet the Parents” film franchise or anything approaching comedy. Similarly, Douglas’ Billy the bridegroom, is a variation on the slickster roles he’s played since “Wall Street’s” Gordon Gekko. The wildcard in “Last Vegas” is Freeman. Not a comedic actor either, having cut his teeth on myriad thuggish roles in the 70s. He is now an elder statesman and by God, God. Comedy is not his strong suit, but he comports himself OK as Archie, who has a way with cards and is a gentleman through and through. The window scene is cute and funny. 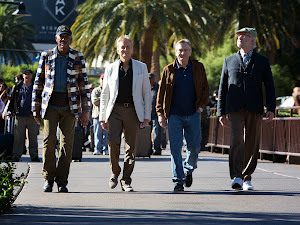 Vegas, where the boys are: Archie (Morgan Freeman), Billy (Michael Douglas), Paddy (Robert De Niro) and Sam (Kevin Kline). The strongest of the four performances – and not at all a surprise – is Kline’s. He is a comedic actor and could have played the role of Sam with his eyes closed. He is immediately believable and comfortable – and utterly comfortable to watch – as the nerd in the pack. To borrow a phrase from “Last Vegas,” p.r., these are legends – working together for the first time. That is the film's raison d'être. When all is said and done, it probably doesn’t matter that "Last Vegas" is not good. The real treat is watching masters at work, even when they are not being masterly. “Last Vegas” is rated PG-13 on appeal for sexual content and language. ; visit http://www.lastvegasmovie.com/ to learn more about the film.